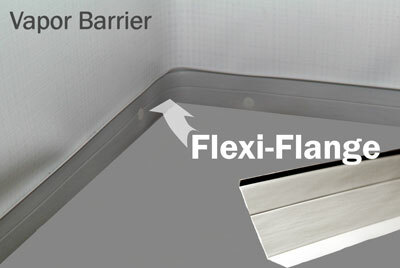 Flexi- Flange by GrateProducts is designed to create an air tight seal along the wall and floor joint in your basement. The Tuffshield Vapor Barrier is neatly secured along the flange, creating seamless barrier from moisture and water. Flexi-Flange protects the Barrier from the lime and mineral deposits that can deteriorate the vapor barrier over a period of time. As such, you will get years of worry-free service. Contact us about Flexi Flange in Richmond, Virginia as well as Fredericksburg, Charlottesville, Williamsburg, Ashland.